whelp. talk about a mood killer. Way to continue to be the worst, Alex. Also is it confirmed that this isn't influenced by the show? Yeah they said in the letters they’re doing their own thing. I've heard that before, but this just dovetails to the show so perfectly that it does seem like a weird coincidence. Unless the show heard about the comics plans and decided to follow that, but considering production schedules that also seems unlikely. 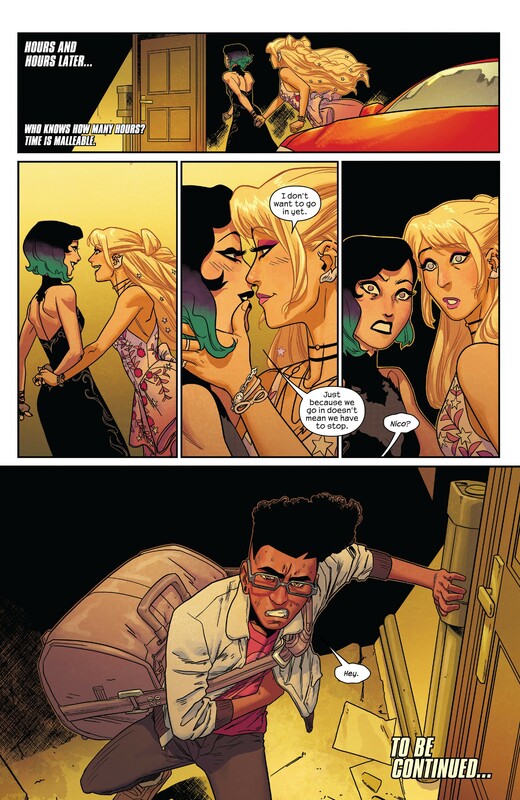 Of course this infinitely better done than the shows narrative mess and I can't even feel conflicted about this as I still don't quite get Vaughan's plans for the second Runaways series. I think the show might have some influence but for the most part the comic just comes off as fanservice (which isn’t inherently a bad thing) for fans of the original run. For example they brought back Victor who was killed off in Vision and has nothing to do with the show. This is a good point, even if Viktor is from the second season of Runaways. I think, to me, it almost feels like doing things to mend and make stuff more sensible, with some surprising results. 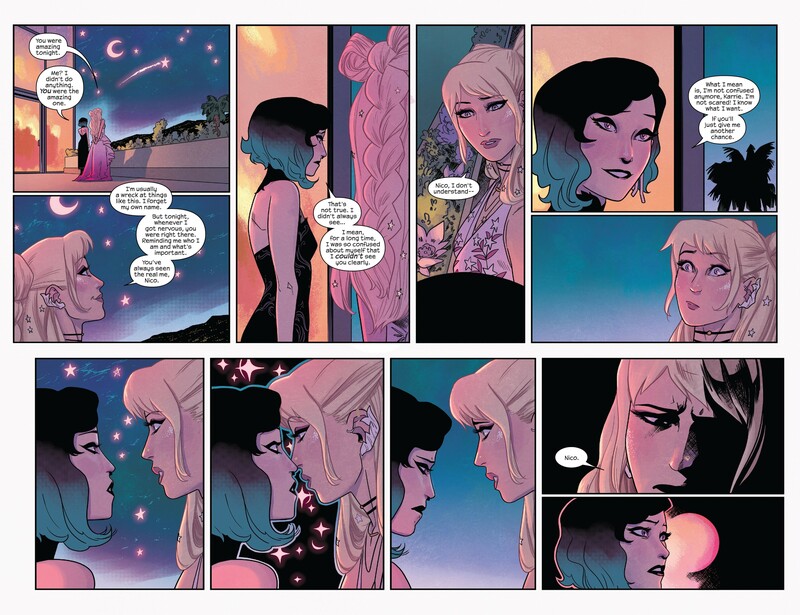 I mean even the Nico/Karo stuff, going in to a different direction than I expected, at least is a resolution to that story whereas Vaughan just felt like he was really uncertain what he actually wanted them to be. I don't even mean from a romantic point of view, but rather what he wanted that core relationship to be like. yeah... but some of the stuff was very contrived... I don't see Gert being so.... determined to bring everyone back together when for the most part, everyone moved on... I mean wanting to get together again yeah... but not abandoning their new lives to do it... you know what I mean? Nico X Karo has always been a popular ship among runaway fans. It is one that has been going on since pretty much the first volume. The book was aware of it and the author decided to just make canon a popular ship. Now, for the tv show, Xavin wasn't available. if the Fox deal solves the rights issue, they will probably be, but the tv show had to operate on the assumption that they would never get to use Xavin, which means Karolina had no LI. to solve it you have two choices, either you make a new character solely for the show or you make one of the characters gay. Luckily for you, there is this fan favorite ship that has always been there. Nico X Karo is just a popular ship whom the creators of both sides were aware of and decided to use. That being said, I do think the show's decision to make Nico Bi probably helped the creative team to canonize it in the comics, as well. Because these are not completely isolated things that do not affect one another. there is a lot going of behind the scenes that often goes unheard of and the creative process is not something creafted in it's entirety. In short. 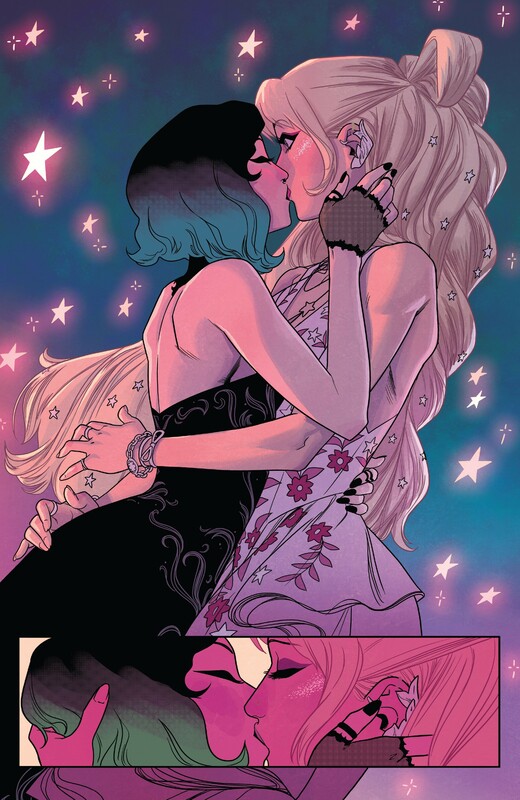 I do think that, when Marvel Editorial gave the greenlight to this panel, they were aware that Nico was bi in the tv show. But not that she is bi because she is in the show. Skrulls are available... they will be main characters in Captain marvel. they are available now, not necessarily when Runaways was still in production (the first serious discussions began around 2016). Admitely, I recall most sources couldn't give a clear answer. But the fact they were not even mentioned in GOTG (despite pretty much all other major cosmic elements receiving at least a nod) leds me to believe they weren't available, either because Fox had the rights, or Marvel wasn't sure if they had the rights and did not want to risk it. Now, it sounds silly that Marvel wouldn't know whose characters they had the rights to, but remember, they did not realize Fox had the rights to Ego until GOTG Vol. 2 was well into production and had to make a deal with Fox. I do ship these two, but the timing is a little suspicious. And did they ever explain why Nico has two arms again? They have said that something definitely happened and Nico does not want to talk about it. It is not being forgotten, but it seems the answer is a long-term plot thread. No, but it is in the first issue and this issue has a scene implying Nico is not well. Goddamnit, Alex! STOP RUINING THINGS! 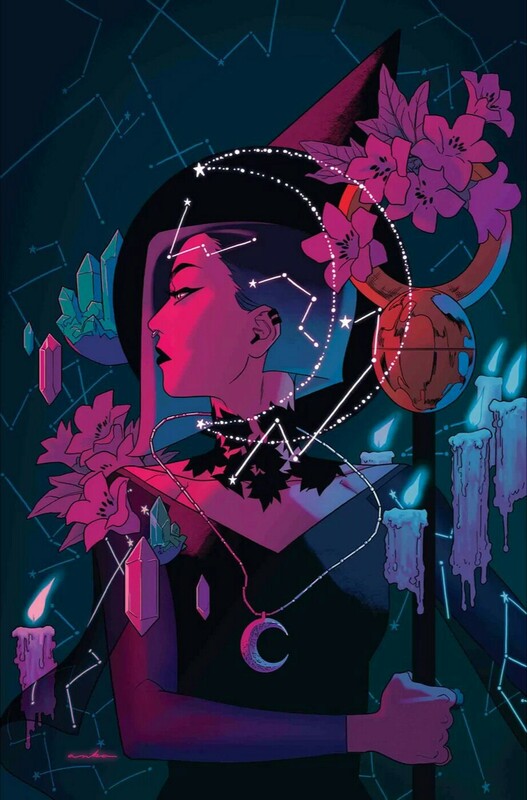 I really love this cover and how it uses blue, purple and pink (the colours of the Bi flag) on an issue about Nico accepting her own bisexuality.